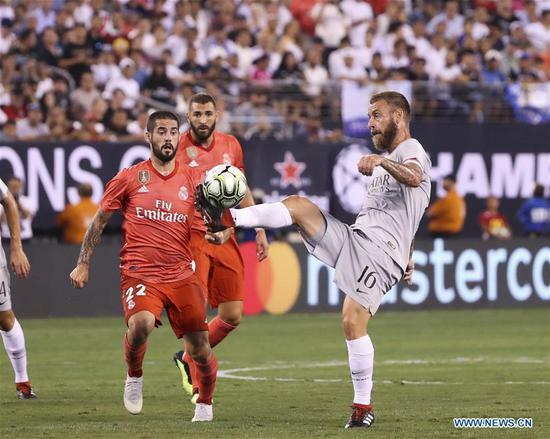 Real Madrid won over AS Roma 2-1 in the International Champions Cup on Tuesday at the MetLife Stadium in New Jersey. Real Madrid forward Marco Asensio opened the scoring after one and a half minutes, assisted by Gareth Bale. The Welsh star scored about 13 minutes later, assisted by defender Daniel Carvajal. AS Roma midfielder Kevin Strootman scored in about 37 minutes into the second half, assisted by forward Patrik Schick. More than 51,000 people came to MetLife Stadium to watch the game on Tuesday night. The International Champions Cup is a pre-season tournament that has been held every summer since 2013. This year, the tournament kicked off on July 20 and will conclude on Aug. 11. Eighteen elite clubs including Real Madrid, Manchester United and Juventus will play in a total of 27 matches to be held in the United States, Singapore, and Europe.